Over the years, Zara has come to mean a lot of different things to a lot of different people. To some, it's a place to indulge in handfuls of the most current trends all at once, and to others, it's the best place to buy all your basics. But no matter who you are, navigating the many sections and endless products offered at Zara can be overwhelming. Since we believe excellent style transcends age, we wanted to take some time to highlight the maturer sections of this fast-fashion retailer that are guaranteed to aid in the assembly of an outstanding age-appropriate look. The sections we are highlighting are merely to point out a few categories we think women over the age of 50 would particularly like, but that's not to say you can't wear whatever you want, from wherever you like. We are just here to give you some shopping ideas and keep you looking as stylish as possible. Keep reading to shop the best Zara sections when you're over 50! The coat section at Zara is quite impressive. Whether you are looking for a timeless style or a statement piece, the store's selection is sure to give you more than enough options. A great statement coat for any wardrobe. This masculine coat has a feminine edge with a bold pop of color. An outerwear piece you can wear with endless ensembles. While investing in a high-quality blazer is something we always encourage, Zara has proven over and over again via quality structure and tailoring that its blazer section is a comparable alternative. This basic blazer is a wardrobe essential for every working woman. The quintessential blazer for hot summer days. This edgy white blazer adds that "something extra" to any ensemble. The best part about Zara's blouse section isn't that it offers a variety of styles (although that's a plus!). Instead, it's that the retailer is constantly updating its inventory, always giving you new shopping opportunities. The cut and color of this top are just the right amount of flirty. A more structured yet sophisticated upgrade to your classic white blouse. This blouse pairs perfectly with distressed denim. You need not look further than Zara for shoes that are on trend, affordable, and available in any style your heart desires. If you are in need of flats, heels, or sneakers, this section is your one-stop shop. Block heel, slingback, and neutral in color. Can you think of more useful shoes? The feminine bow detailing instantly upgrades this basic slide style. Add a pop of color to classic pumps. The colors, patterns, and fabrics offered in the button-down category at Zara are almost too good to be true. Because this one's a closet staple, having an affordable place to shop for several is a win-win. The cuffed sleeves on this menswear classic make this blouse feel extremely feminine. 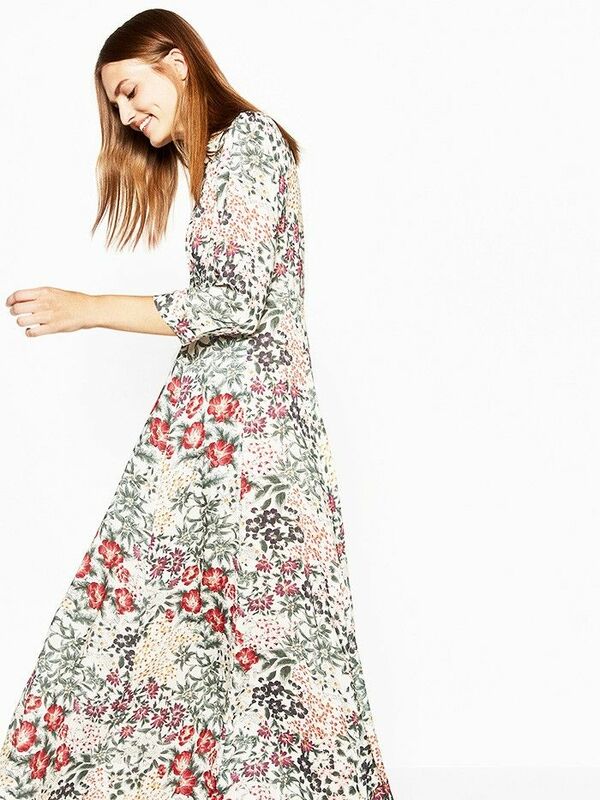 Feminine florals will brighten up any look. The trouser section at Zara is truly ageless, but the office-appropriate and tasteful styles it offers are a step above the rest. Slender, fitted, and unbelievably flattering. Culottes look great on too many body types to count. With the comfort of this drawstring waist, you will want to live in these trousers. Knitwear is a broad category that includes everything from knit tanks to warmer sweaters, and Zara's assortment will ensure you find every knitted piece you're looking for. A great layering sweater indeed. The perfect throw-on knit for any occasion. An edgy, structured piece that will definitely make a statement. A bag can tell a lot about a person, and especially if you are a mother, aunt, or grandmother carrying around an array of trinkets for your little ones, you want a bag that can look great while storing all your necessary belongings. A simple, elegant addition to any outfit. Chic and sophisticated, this bag is definitely a head-turner. This bag is extremely accessible and perfect for any daytime activity. What are some of your favorite sections to shop at Zara? Let us know in the comments below!